AML Trunk Show: Christine Shirley Shines at White Dog Wayne! Designer and AML friend 'Christine Shirley' will be hosting an uber-fabulous trunk show at White Dog Wayne on Sunday, June 10th. This is a Main Line shopping soiree so chic and fun it is hard to believe anything could top this! As you probably all know from now, I am a HUGE lover of everything repurposed and vintage. So you can imagine my excitement to be invited to partner with this local designer’s upcoming event! Christine Shirley will be hosting a fabulous trunk show at White Dog Wayne on Sunday, June 10th. This is a Main Line shopping soiree SO chic and fun it is hard to believe anything could top this! Join dozens of local ladies on Sunday, June 10th from 2:30 p.m. to 5:00 p.m. on White Dog’s patio to shop, mingle and meet Paige Sullivan—the talented designer behind this eclectic and perfectly preppy mix of vintage fabrics and materials. 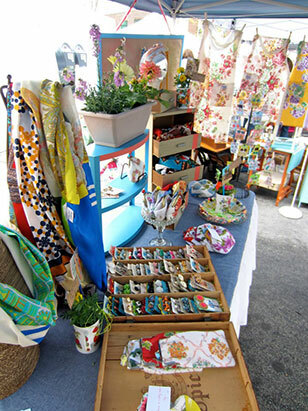 Paige’s popular creations include handbags, hair accessories and other wonderful inspirations from recycled materials. The Trunk Show is free to attend for all ladies (Main Line Moms bring your daughters!) and will feature complimentary bites from White Dog executive Chef Zach Grainda. Attendees will be treated to refreshing sangria, delicious flavored iced teas, chilled soup, tea sandwiches, profiteroles, fresh fruits, and local cheeses. Please RSVP here on Facebook or email: rsvp@aroundmainline.com so that we can plan accordingly to the best of our ability with Miss Sullivan and our friends at White Dog. This event is rain or shine. If weather is inclement, the Trunk Show will be moved inside the restaurant. Any inquiries about the Trunk Show or hosting future events with AroundMainLine.com contact Sarah Lockard. Thank you AML ladies and we welcome you to White Dog on June 10th! Christine Shirley designer Paige Sullivan can be reached via email: paigecsullivan@gmail.com.